I had a long interesting discussion with some of my students today. First I asked them how many of them had been in a car while the driver was texting. The answers were overwhelming. Our of 46 people surveyed, 38 indicated that they had been a passenger when the driver was doing something even more dangerous than drunk driving. More dangerous you ask? I can’t be serious, can I? Car and Driver Magazine did a study by rigging a redlight to a car and having a driver drive unimpaired at 70mph on a desert track. When the redlight was flashed, it took him .54 seconds to hit the brake. Next, it was a person who was legally drunk (.08) and it took that person .54 seconds plus 4 feet to hit the brake. Next, they tested a person who was reading a text or email while driving. It took that person .54 seconds plus 36 feet. Next, it was a person who was writing a text while driving. It took that person .54 seconds plus 70 feet. Can anyone see the problem here? People commonly, day in and day out, are using their phones while driving and endangering everyone around them – and they think they have it all under control. But they don’t. I’m pretty sure parents lecture their kids on drinking and driving, but perhaps have overlooked something even more dangerous that happens all the time. As I told my students, each car has this unique device called a brake in which one can stop, pull off the road, and read their text message if it is that important to them. There is also something called not answering the phone. We have become so conditioned to immediately reaching for our phone when we hear the ding or feel the buzz. It’s as if we are expecting breaking news or a word from God himself. In reality, 99 percent of the text messages we receive are so mundane that we could wait days to read them without ever altering the orbit of the earth around the sun. You can be confident that there is nothing earth-shattering in that text that can’t wait a day, let alone ten minutes. I hope everyone will think seriously about this. Put down your phones. Stop endangering those who are riding with you and who are driving around you. You just might save a life. Here’s the layout of the program. In this project, I had an MP3 musical track in which I needed to add some vocals to. 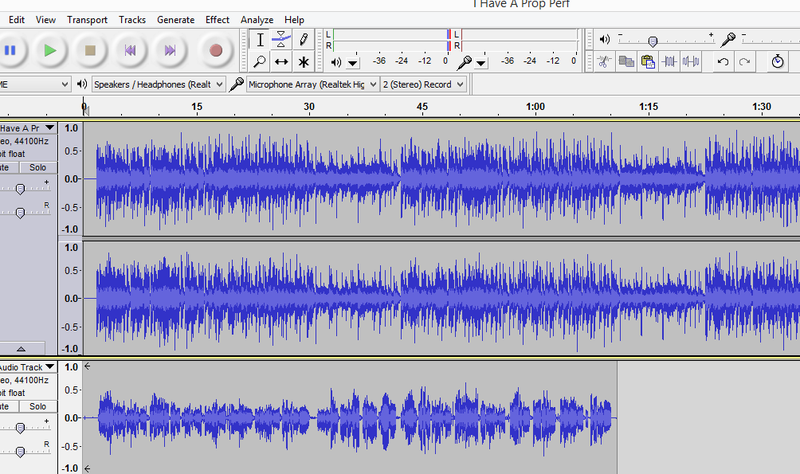 I opened Audacity, dragged and dropped the MP3 file which not allows me to manipulate it – trim, mute, increase decibels, etc… I decided to sing, so I sung some lyrics in the second track below, exported as a MP3 and I have a new song file with vocals. When writing musicals with my students, I find this program invaluable for editing songs and creating samples. The interface is super easy, and it’s really a powerful program for all types of audio manipulation. Need a portion of a song for an intro to a drama? No problem. Cut and fade it where you want it. Need to mash together two song files? No problem. Need to record vocals over a sample track. Piece of cake. I have found lots of practical uses. A quick Google search will get you a free, powerful audio editing program in the matter of seconds.